Born Marcus Antoninus Gordianus Sempronianus Africanus around 159 AD. He was Consul under Elagabalus and was Proconsul in North Africa when a tax revolt broke out. The wealthy families of the area petitioned him to become emperor in opposition to Maximinus and he agre ed on 22 March 238, raising his son Gordian II to the rang as well. The pair sent a delegation to Rome asking for the support of the S enate which was given. 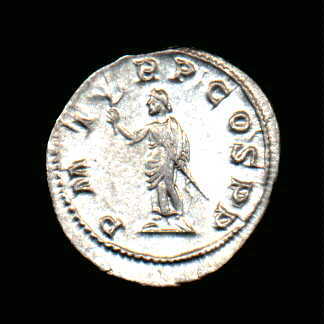 Before the delegation returned, Capellianus, Governor of Numidia, invaded Africa with Legio III Augustus. 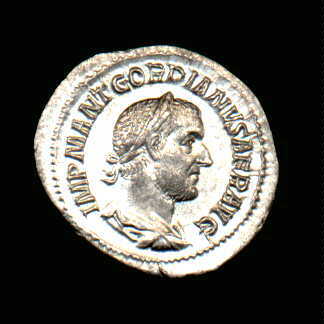 Gord ian II went to meet him but his inexperienced troops were destroyed and Gordian II was killed. Gordian I hung himself on 12 April 238 AD when he received the news of his son's death after a reign of 22 days.